Blues Rock fans get ready to rejoice; Royal Southern Brotherhood – Don’t Look Back: The Muscle Shoals Sessions the band’s third release on the Ruf Records label, is 14-tracks of listening pleasure. In addition to “the usual RSB suspects” – Cyril Neville, Charlie Wooten, Yonrico Scott, and Bart Walker, joining the band on the release are the talented Ivan Neville, Tyrone Vaughan, Jimmy Hill, Max Abrams, and Paul Armstrong. 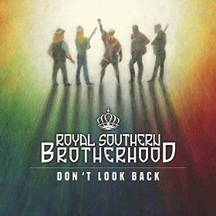 Royal Southern Brotherhood – Don’t Look Back: The Muscle Shoals Sessions was recorded at the legendary FAME Studios in Muscle Shoals, Alabama and was produced by Tom Hambridge on the Ruf Records label. Interesting to note is that the FAME Studios, established in 1960, has recorded some of the all-time greats including Aretha Franklin, Little Richard, Wilson Pickett, Etta James, and Otis Redding to name but a few. The 14-track release opens with the blazing guitar intro, I Wanna Be Free, penned by (Thomas) Bart Walker, Cyril Neville, and Tyrone Vaughan, who like Cyril Neville of the multi-talented Neville family, has his own royal musical lineage as the son of Grammy® award-winner Blues Rock guitarist Jimmie Vaughan, and the nephew of the legendary Stevie Ray Vaughan. Next in the line-up are two Neville/Walker songs, Reach My Goal and the title track, Don’t Look Back, which showcase Bart Walker as a guitarist and songwriter. Don’t Look Back, has a Zydeco flavor, Cyril’s distinctive vocals, and rich harmonies. While fans may know Bart Walker joined the band when former RSB band mate Mike Zito left to pursue his own music, how many out there know that this fiery guitar player was also classically trained as a formal opera singer? Bart Walker is a man of many talents. The band strays from in-house talent with the catchy Danny Dugan song, Hit Me Once with its rhythmic punch, and then slides into a bit of Funk with The Big Greasy, written by Cyril, Charlie, and Daniel Grover. Penzi, a Cyril/Charlie song, has a decidedly Latin feel to it, evocative of Son Cubano music, and is one of my favorites on the release. The band continues with It’s Time For Love written by RSB members Cyril, Bart, Charlie, and Yonrico, then captures the soul of Louisiana with the Cyril/Bart song, Bayou Baby with its enchanting storytelling lyrics, followed by Poor Boy, written by Tyrone Vaughan and Will Knaak. Cyril and Bart work their magic again on They Don’t Make ‘Em Like You No More, next is Come Hell Or High Water written by Cyril, Charlie, Yonrico, and former RSB band mate, Devon Allman, and the band finishes strongly with the slow and sweet love song, Anchor Me, written by Cyril and Grammy® award-winning songwriter and producer Anders Osborne that perfectly closes out the release. Websites where you can procure Royal Southern Brotherhood – Don’t Look Back: The Muscle Shoals Sessions are Amazon, Best Buy, and Ruf Records. © July 2015. Luxury Experience www.LuxuryExperience.com All Rights Reserved.